I've been reading a book lately, A Beginner's Guide to Constructing the Universe by Michael S. Schneider. Reading, might not be the word....contemplating and absorbing perhaps. It was recommended on a blog, I believe by Margaret Bremner. I'm not that far into it, but it's SO interesting. In the 2nd chapter, about the number 2, I learned about vesica piscis, the almond shaped area of the Dyad (two overlapping circles). Here is what I drew in my journal after reading it. 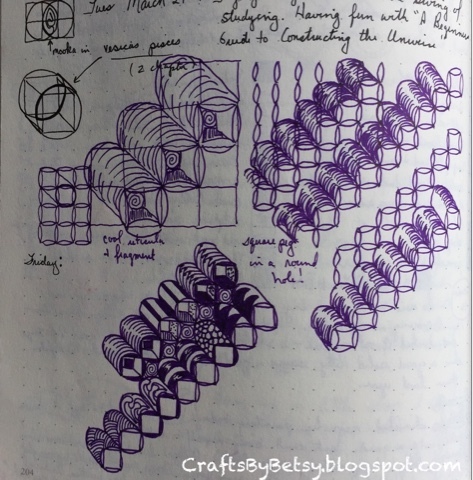 My dot grid notebook helped me to see the square as well, or rather helped me to see Bales and therefore the square, which quickly evolved into the cube. Then I tried it as reticulum. 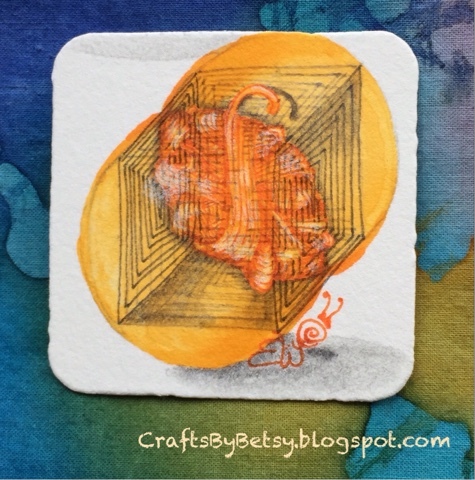 A week or so has gone by and The Diva Challenge is circle square string theory. I thought I could make it work. That's the problem, I forced it. And since I was seeing romanancy in that reticulum, I gave that a try as well. So I like the tile, learned a lot, but it's too busy, too forced. 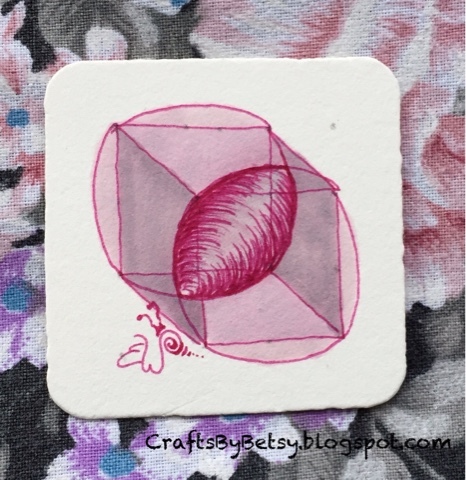 After looking at my journal I realized that first basic cube and vesica piscis was my favorite. Sort of one elaborate reticulum square (or cube!) so Bijou and I played with it a bit. He's been wanting to play with my Copic markers. Here's the more basic retry. 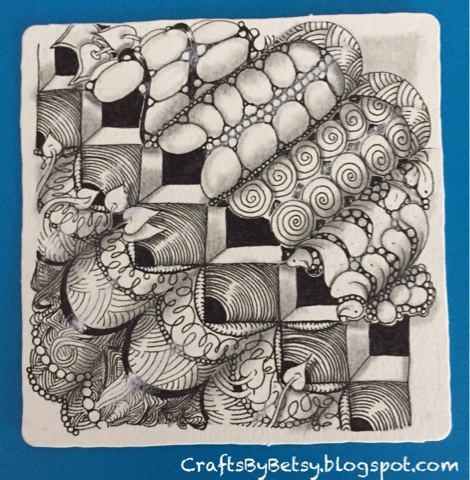 And then I drew the circle and square as a pencil string (duh! should have listened to the instructions to the challenge ;-) and was able to make the vesica piscis as Enyshou with an orange micron. Next I added Emingle with a gray Graphik line maker. It was a little dark, so I did two sides of the cube with it and the rest with a Stabilo grey fine tipped marker that was a touch lighter. I added the Copic in yellows/oranges and hi-lighted with the colorless blender before adding some graphite shading and white charcoal pencil, then redefined some of the orange micron lines. I'm in love with this tile! It seems like a beginning. But I guess that's pretty appropriate for vesica piscis, emerging from the one to the many. I hope this inspires you too! All of these are very cool😉 Talk about dimension! Wow! Beautiful combinations and wonderful color! All are just wonderful! Thank you for this inspiring post! This is fascinating! I'm going to have to read/contemplate that book! Wonderful collection of tiles. I like the way the yellow bijou turned out. These are beautiful. Great explorations of the challenge and of the vesica piscis. Love where you are going with these. The first tile is a little busy but has really interesting dimensionality, but the bijou tiles are fascinating little windows on a wider world. So cool.